Australian vertical mine shafts often venture underground for well over a kilometre, and occasionally over three kilometres is certain other countries. To achieve maximum stability during haulage over such long distances, shaft conveyances and skips are kept on track by purpose-made guiding systems. Conveyance guiding systems can take the form of a metal fixture or, alternatively, of a set of ropes, aptly called guide ropes. Guide ropes are an excellent alternative to their fixed counterparts thanks to their ease of installation and reduced cost. 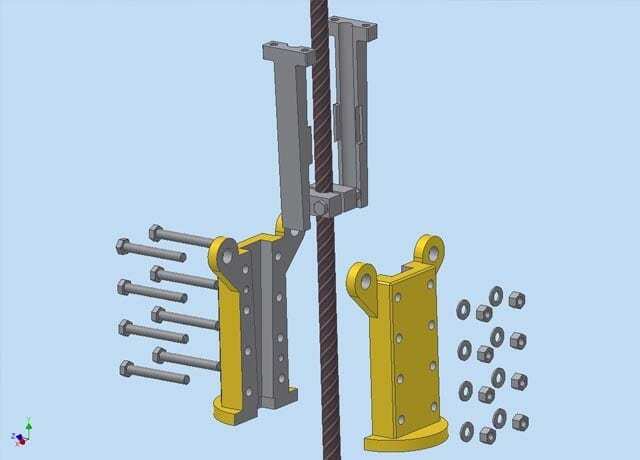 Guide rope attachments provide the necessary connection between the top and bottom of the guide ropes. The applicable regulatory framework is provided by the AS 3637 Underground Mining–Winding Suspension Equipment standard series, which covers manufacture, usage and testing of mine lifting components, including rope attachments. Notably, items of attachment come with a prescribed service life length and are required to be discarded on or before its completion. Reliance Hexham has facilities to undertake all aspects of rope suspension equipment supply for the Australian and International Mining industry. We are specialised in custom solutions and offer expert design, manufacture, testing and refurbishment services for guide rope attachments. This includes the latest 3D drawing programmes, CNC machining, forging, heat treatment and nationally accredited proof load and magnetic particle testing facilities. Attachments represent the core of our business. We are proud to provide tailored design and engineering solutions leveraging our Engineering Team’s professional qualifications and extensive experience. We follow a unique design and quality control process to ensure that your product is always delivered in high quality, on schedule and compliant with all the appropriate guidelines and regulations. Reliance Hexham manufacture rope attachments, as designed in-house or following an existing design, with a team of specialised tradespeople retaining over 165 years experience between them. Our attachments are made from high-grade materials and offer safety, ease of use, and reliability. Among our services, we likewise provide heat treatment as per Standard requirements. Every rope attachment is heat treated as required and samples are then Brinell tested to verify results which are traceable as per our NATA Accreditation. 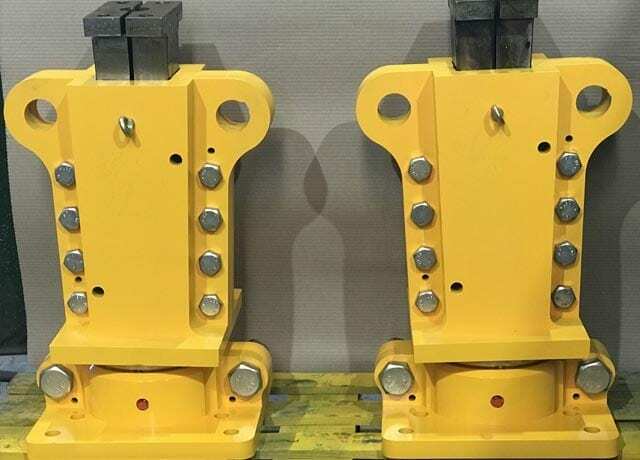 The AS 3637 Standard series mandates for guide ropes and their attachments to be systematically inspected, maintained, and measured for wear and tested. Routine inspections must check for deformation, corrosion or other visible imperfections. Proof Load Testing – as per Australian Standard requirements, all components of attachments in mining need to be designed for a safety load factor of 10. This requirement rises to 20 where chains and shackles are used for kibbles, cages or stages, without the employment of a safety chain. Destructive Testing – carried out to the component’s failure, with the aim of understanding its structural performance or material behaviour under increasing loads. Magnetic Particle Testing for cracks – if cracks are indeed found, attachments should not be repaired but rather replaced due to significant safety risk. Brinell Hardness Testing for tensile strength. All rope attachments testing is fulfilled directly at Reliance Hexham’s premises where our experienced and competent personnel use advanced testing and precision equipment to ensure the maximum safety and reliability of our results. Once tested, your equipment is carefully cleaned from rust, dust and any other foreign material in order to maximise its service life, and returned to you in its best achievable condition. 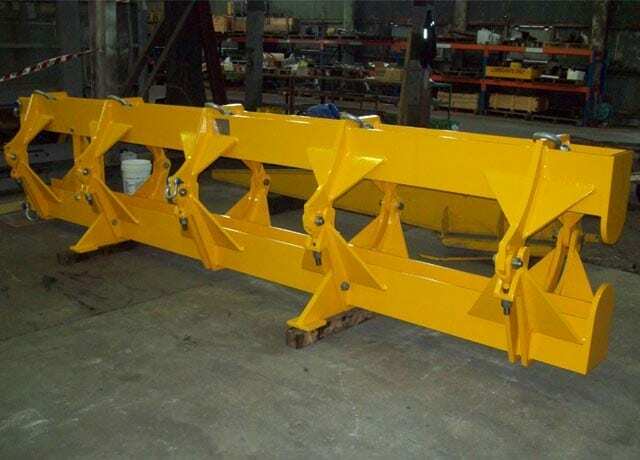 Reliance Hexham also designs, manufactures, tests and refurbishes other shaft lifting equipment, including transporters, skips, cages, conveyances , couplings and drawbacks . Through our close collaboration, our partner company A. Noble & Son Ltd can offer a range of wire rope solutions for both open cut and underground mining. Our team of specialists will be able to provide dedicated advice for your specific application and requirements, and is always at your disposal for consultations or quotation requests.